East Midlands Trains Passengers should expect an average fare rise of 1.3% from January 2, 2015 – equivalent to around 17p. The rise has been marked by the rail operator as the lowest increase for five years, and a real term reduction compared with the current rate of inflation. In addition, fares on all Advance tickets and Anytime fares to London are to be frozen, and the company has confirmed that there will be no change to car parking charges from January. Separately, the Government confirmed in Wednesday’s Autumn Statement that season tickets and other fares it regulates will rise by 2.5%. The overall average price increase for all fares across the UK in 2015 will be 2.2%. Rail passengers can check ticket prices for 2015 from December 5 at stations, online. David Horne, Managing Director of East Midlands Trains, said: “We are pleased to have cut the cost of travel in real terms for our customers. “Money from fares goes towards running and maintaining the railway which benefits every household in the country, by improving journeys, creating employment and helping to boost the economy. “Over the next five years, Network Rail is spending on average £27m a day building and maintaining a better railway that benefits passengers, communities and businesses. 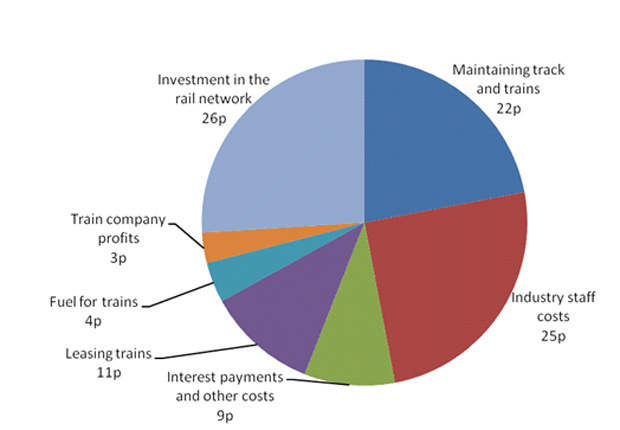 On average, every pound of income that the railway receives goes on the items in the chart. Recent improvements to the East Midlands Trains service include the introduction of better broadband, and a £250,000 improvements programme at Lincoln station ticket-office.